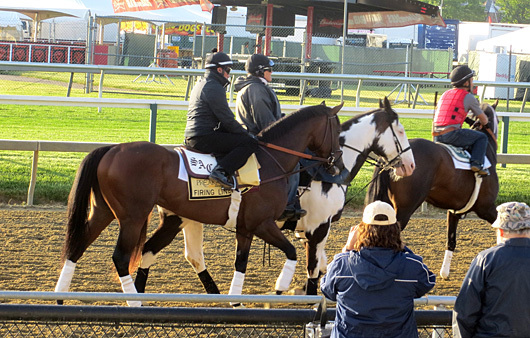 With Preakness horses going out at all times during the morning, it was up to the Bob Baffert pair of American Pharoah and Dortmund to provide most of the entertainment for the 8:30 show. 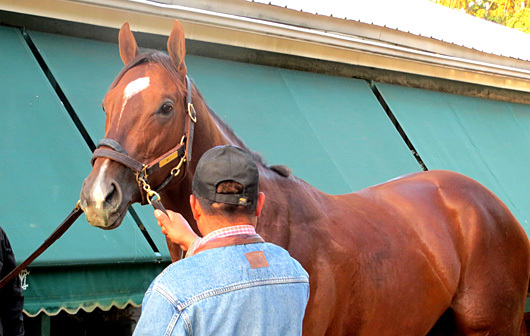 Both colts appear none the worse for wear after their tough battles in the Kentucky Derby, and the same has to be said for Firing Line, who has held his flesh beautifully and wanted to do more than his once around jog. 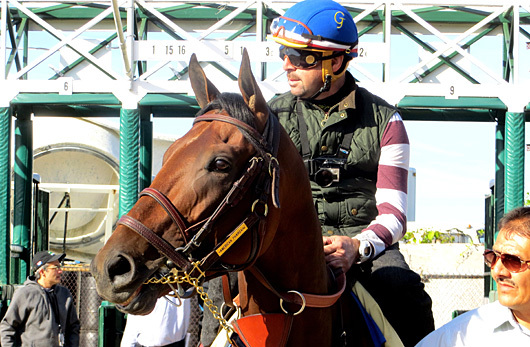 But the star on the racetrack was no doubt American Pharoah, who, as he did at Churchill Downs, just floated around the track and a good clip, his feet barely touching the ground. The gallop brought rave reviews from those who watched it, including Danzig Moon's assistant trainer Norman Casse, who sent his colt out for a strong gallop as well. 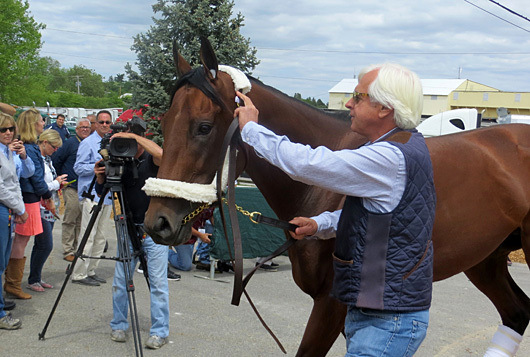 Bob Baffert leads American Pharoah into the barn following his arrival Wednesday afternoon. 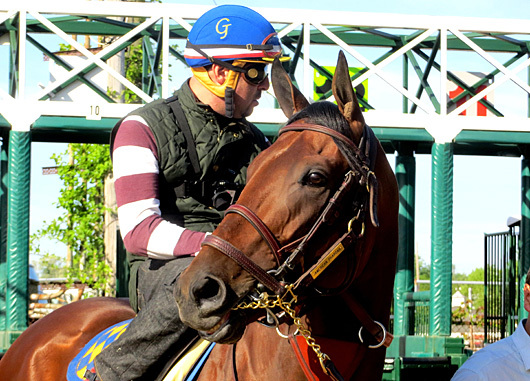 American Pharoah is bright and alert as he heads to the track this morning. 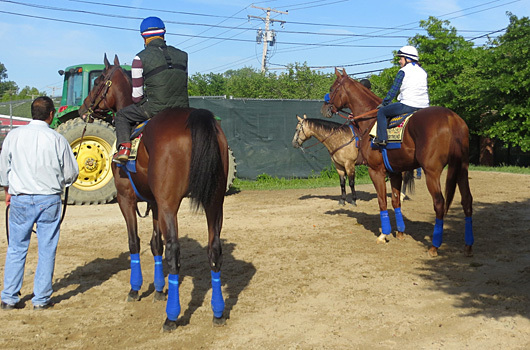 American Pharoah checks out his new surroundings as he waits for the track to open for training at 8:30. 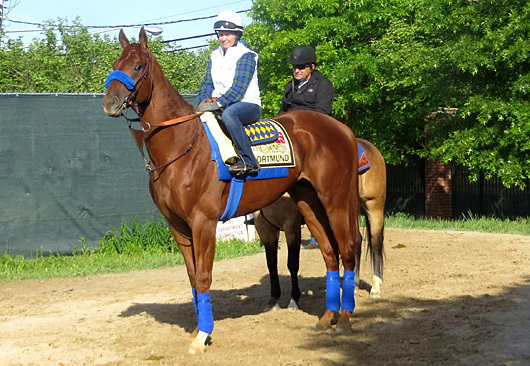 Dortmund strikes a regal pose as he waits to hit the track for the first time. 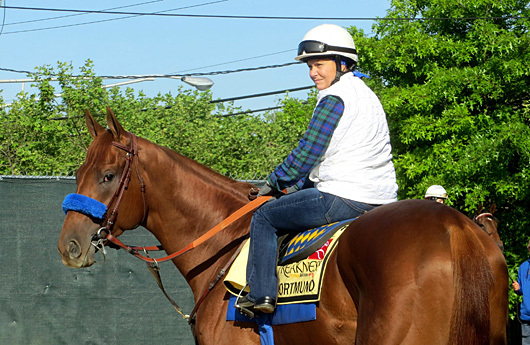 Dortmund always seems to be eyeing something and is one of the best posing horses you'll ever see. The Dynamic Duo patiently waits for the track to open. Over at Fair Hill, about 40 miles and a few light years from Pimlico, Divining Rod leads the first set set trained by Arnaud Delacour (on pony right behind Divining Rod). 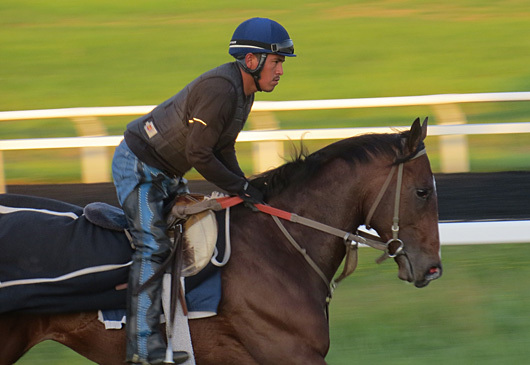 Divining Rod has his last stiff gallop on Wednesday, then left for Pimlico the following morning. 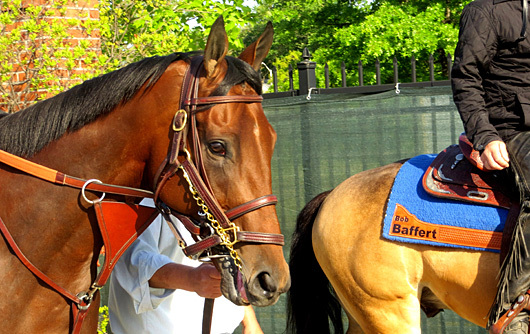 Firing Line, just by his demeanor, was able to put on a show for onlookers. This horse has no markings but you can spot him 100 yards away just by his head and the way he carries himself. He may be one of the longest shots in the field, but no horse looks better physically than Tale of Verve, who is just a handsome colt all around and whose coat looks awesome. Mr. Z has caused quite a bit of commotion thanks to his 11th hour sale to Calumet Farm that allowed Wayne Lukas to run him. 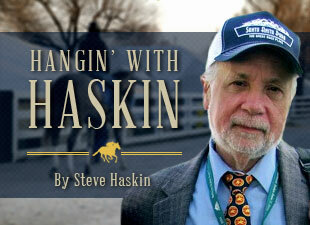 Let's just say he didn't ship the colt to Pimlico just to give him a vacation.